If you’ve got access to a guillotine or ruler and a scalpel, (or even a pair of scissors if you’ve got a steady hand!) you can save on your marketing and promo materials by printing Flat Unfinished Sheets instead. These sheets are printed in SRA3 size (that’s 460mm x 320mm), and allow you to organise and fit as many designs onto one sheet as possible, then finish them by hand when they arrive. They come in27 paper stocks, so you’re never short on choice and they start from just £10, perfect for education print, promo and loads more. These versatile, affordable prints can be customised any way you choose and used for a whole host of different print projects. Whether you need promo on short notice (selected options are available with next day delivery), informative handouts, open day guides or even mini course guides – Leaflets and Flyers get the job done without breaking the budget. 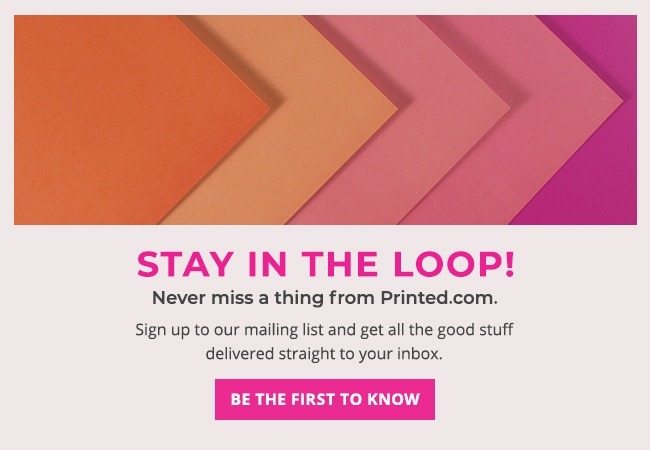 At Printed.com, you can add up to 10 items to your basket and pay just one delivery charge – so why not shop our dedicated Education Collection and get everything you need in one place? Shop the Education Collection here, or if you’re looking for event and open day print, why not check out the Exhibition Collection? With everything from portable Banner Stands that can be folded away and stored easily and quickly in-between events, to all your on the day promo like Display Boards, Postcards and Outdoor Posters. For the affordable way to print course introductory information booklets and education prospectuses, Saddle Stitched Brochures are the way to go. 250 A4 brochures come in at under £300, so you could be spreading the word and showing off your best bits for even less than you thought! (Prices based on a 12-page brochure with a silk 170gsm cover and 150gsm inner pages, without lamination). Not only can you collect Printed Points for every £1 you spend at Printed.com, customers can even donate their points to you. You can use your points towards free print and classroom essentials, making it even more affordable to get what you need. When you register with us as an education professional or student, you’ll get 15% off each and every order you place with us, for life. Sign up with us by filling out the quick form here, using your academic information. Once we’ve verified your details, we’ll generate a unique voucher code and email it directly to you within two working days. You can then log in, choose your print and enter your code at the checkout to claim your 15% off. That’s not all. At Printed.com, we’ve created a dedicated Education Collection, full of essentials like Display Boards (which can be supplied with drilled holes, so they’re ready to hang as soon as they arrive), plus Self Adhesive Vinyl, Leaflets and Flyers for promos and events, plus all the little things, like Branded Notebooks (for diaries), Stickers, Certificates, Bookmarks, Letterheads and Printed Envelopes too. Are you a teacher? How are you using print to help inspire in the classroom? Let us know in the comments. And to make sure you never miss a thing, and get up to date advice and tips for making the most of education print, follow us on Twitter, Instagram and Facebook. Want more? Discover why print isn’t dead when it comes to education by clicking here, or get set for open days with our top tips here. I moved to unfinished sheets for my coaster inserts, best thing I ever did! I’m doing online courses with The London Art College.